Sarny Castle’s chapel was built in the 1720s, together with the parish church, now a Basilica minor, in the nearby Wambierzyce. Sarny and Wambierzyce as late-Baroque houses of worship are an expression of a particular devotion of the Counts Götzen to the Catholic Church. The Götzens began living in Sarny, then known as Scharfeneck, in 1660. Their position within the Habsburg monarchy greatly increased during the Thirty Years’ War when Johann (1599-1645) was an imperial general. Thanks to his successes in the battlefield he was created baron and then count. His son Johann Georg (1623-1679) in 1660 received from the emperor vast estates in the County of Glatz (Polish Kłodzko), including Scharfeneck, which would for more than 200 years be the seat of this powerful family. The first name of each Catholic Count Götzen at Scharfeneck was Johann in a tribute to the first count as well as to the patron saint of the family, St. John of Nepomuk. Naturally then, Johann Franz Anton Count Götzen mentioned his reverence for the martyr saint in the founding act of the Sarny Castle chapel dated August 6, 1738. Taking into account the shape and size, the chapel in Sarny is actually a church; German researchers often refer to it as such. Arne Franke calls the building “a court church” (German Hofkirche). German participants of our masterclasses in early music who play the cornett also refer to the venue as a church. The castle tower was changed as the Chapel was being built to resemble a church belfry. It served as a belfry until the 1950s. The Chapel in Sarny is bigger than many similar places of worship in aristocratic residences. It’s elliptical, an unusual floorplan. 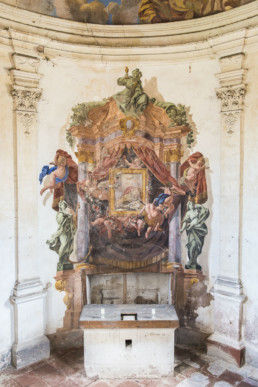 In many prominent palaces the private chapel sometimes takes the form similar to a cupboard placed in a drawing room (the Radziwiłł Palace in Nieborów, central Poland), a bay window (Palazzo Colonna in Rome), or an entire drawing room (the palace in Gorzanów or Chatsworth House in Derbyshire). In Sarny, it’s a separate religious building open not just to the residing family. It dominates the skyline of the castle and the mountainous surroundings, just like the imposing basilica in neighboring Wambierzyce, a village several generations of the Götzens turned into a kind of Jerusalem in Silesia, giving gates and hills biblical names. The Chapel in Sarny is linked with the medieval tradition of the Capella Pallatina – it’s a separate architectural form like chapels erected in medieval castles. It uses the cult of Mary and the Savior to highlight what was then considered a sacred nature of temporal authority. 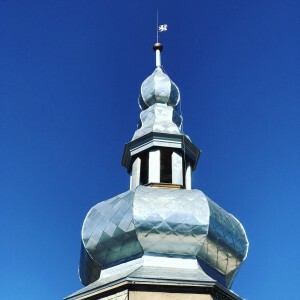 With the Cross of Loraine on its top, the Chapel is the single-most important building in the upper part of the Ścinawka river valley. “In the County of Glatz, controlled previously by the followers of Luther and Schwenckfeld, the role of the official court chapel corresponded with the role of the Catholic Church, rebuilt in these lands mainly by the Jesuits. The chapel was supposed to propagate the faith (propaganda fidei), an effort this order was devoted to. The form of the chapel – a church triumphant – serves that fundamental idea,” wrote Eysymontt. 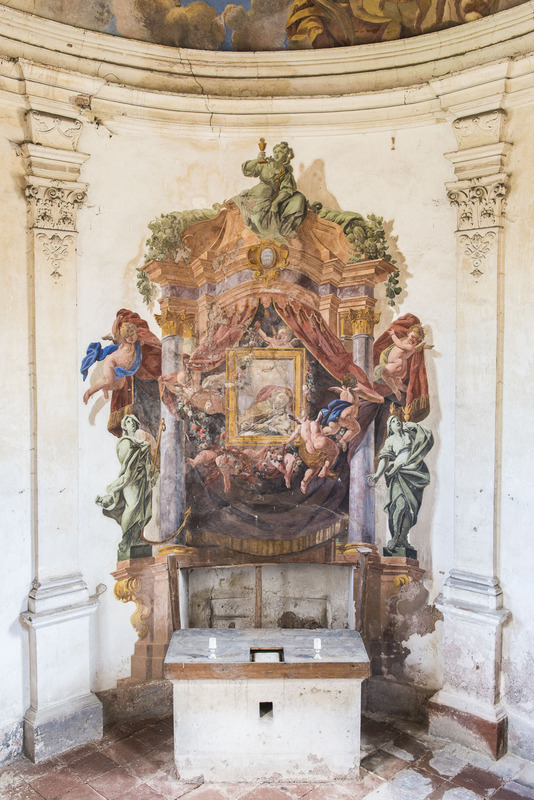 The Chapel in Sarny is therefore among the most striking examples of the Counterreformation attempt to re-Catholicize the County of Glatz through Baroque architecture. The painting that adorns the chapel’s interior, by Johann Franz Hoffmann (1699-1766), was completed in 1738, just months before the death of Franz Anton, Count Götzen. The painter placed his signature and date of completion next to the family crest of the Götzens, above their balcony. The setup of the illusionist parts of the furniture above the balcony brings to mind the thought that the piece had a 3D continuation, perhaps a curtain. The curtain may have separated the chapel, which had no heating, from the house. 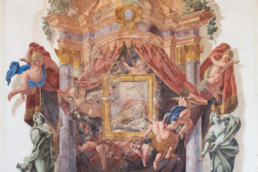 It may have also been a statement of the family’s status, corresponding with the crimson curtain painted in the altarpiece opposite the loge (see pictures below). The Chapel’s interior tells the tale of the life, martyrdom, death and the glory of the altar of St. John of Nepomuk. Inside the windows eight illusionist paintings were hanged on imaginary nails and ribbons. White and red roses in the pictures symbolize martyrdom. The painting was restored in the 19th century and then again in the 1970s by a team of conservationists from Krakow. After 1980, the chapel was disgraced, used a warehouse of boats, car engines and old fridges. Since 2013, being private property again, the chapel has been a center of early music, hosting concerts by the world’s most prominent musicians as well as masterclasses. Since 2017, it’s been available to tourists on a daily basis. Uniquely in Poland, the Sarny Castle Chapel is not owned by the Roman Catholic Church.